Kevin Keehan admits he cannot wait to get started again with Shoreham Football Club as he bids to win silverware with Mussels. 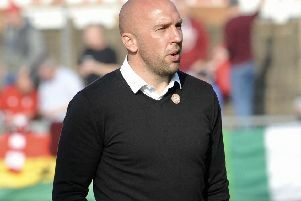 The 30-year-old was joint manager of Shoreham in the 2011-12 season and has returned to the club as Bryan O’Toole’s assistant for next season. Keehan has won the Southern Combination League title three times since leaving Shoreham, for Peacehaven, East Preston and Horsham but he says nothing would mean more than to win the title with Mussels. Keehan is set to be joined by brother, Joe, Rob O’Toole and Andy Pearson at Mussels, which has raised expectations at Middle Road already for next season. Kevin Keehan said: “I’m so excited about going back to Shoreham and next season. “I spent five years there and although we didn’t win anything, I have a lot of good memories and it’s a club I have strong family ties with. “My granddad, John, was manager when they won back-to-back league titles and my dad (Kevin) was playing in that side. “Obviously, for the past eight to nine seasons, Shoreham have been in the bottom half of the table but with the squad Bryan and I are assembling, we want to be challenging at the top. “Bryan is a born winner, like myself, and we’ve signed players in Joe and Andy who Burgess Hill didn’t want to lose, while Rob is unplayable on his day at this level. With the standard of players coming in, Keehan knows Mussels will be a target for other sides and said: “I’ve had this conversation with Bryan already. Getting the players in who we have will mean other teams will want to beat us and it could be like a cup final for them. “We’ve all got to be ready as it’s not going to be an easy ride next season. There’s going to be lots of difficult games and we’ve got to be up for every game. But hopefully this coming season will be very different to the last few seasons for Shoreham. “It would be unbelievable to win silverware with Shoreham. That thought goes through my head every day, knowing the players that we’ve got coming in. “We’re building a team and I know what it would mean to the likes of Keith Hewitt and Clive Harman at the club if we were able to deliver, I can just imagine the smiles on their faces. “We know people are already talking about us with the players who are coming in and more people will be talking when we announce more signings. “We’re in talks with a lot of players and some have won the title time after time and have good experience.